Berlin Energie is applying for the expiring Berlin gas and electricity concessions. As a high-performing and innovative combined network operator, we will manage the energy infrastructures of our city efficiently and reliably, as well as make them future-proof – for both the people and the industry of Berlin. As a state-owned organisation, Berlin Energie stands for open dialogue and transparency rendered into our operations, may it be in the technical management of the network, its strategic development or our contribution to the Berlin state objectives in the fields of urban development, energy efficiency and climate protection. Our competent Berlin Energie team will base its operations and maintenance of the Berlin gas and electricity network on those principles. Furthermore, we will not only maintain the supply security to the highest level, but also enhance it through our long-term investment strategy through the constant renewal and continuous development of the network. We have set service, sustainability, innovation and social competence as our evenly-balanced corporate goals, thus building upon security, efficiency and performance. Berlin Energie is committed to innovation. We will therefore go above and beyond the legal obligations – e.g. prioritising the grid connection of power generation plants based on renewable energies – and adopt a pioneering role as a „transparent grid operator“. We promote the improved integration of renewable energies into the Berlin energy infrastructure by publishing dynamic network data as well as and through the use of new forms of energy storage and conversion systems. As such, we enable stable grid conditions, as well as a secure energy supply to the city – today and in the future! 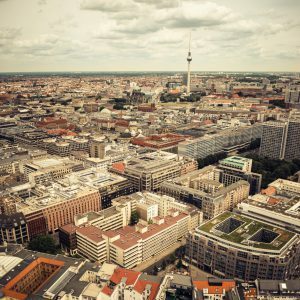 Berlin’s urban development concept 2030 entails a wide range of targets, ideas and measures through which to steer the state of Berlin towards as ecologically and socially sustainable, and simultaneously economically stable future. For Berlin Energie, as a state-owned organisation, this concept, which is the result of the democratic policy process by the people of Berlin, is deeply anchored in our vision and a notion that we actively support. Berlin Energie, is a company rooted in the Berlin community. We will therefore develop a stable and active connection with the people of this city. In order to facilitate a comprehensive citizen participation we will establish and partake into open dialogue with the population as well as integrate its recommendations into our decision-making process. We will cooperate with other competent infrastructure organisations of the state of Berlin in relevant areas and fields, so as to ensure the efficiency, reliability and consumer-friendliness of network operations. Berlin Energie bewirbt sich um die auslaufenden Berliner Konzessionen für Gas und Strom.